I am detailing below the feeding regimes we used to make thousands of Pain de Campagne and Rossisky loaves everyday in the bakery where I worked from 1994 to 2003.
e.g. French Leaven was refreshed from 41kg to 130g every 8 hours. We had 3 bins this size, enough to make 6 x 120kg of dough for pain de campagne, with 3 sets of 41kg of leaven left for refreshment, which would take place 4 to 5 hours later, given our leaven fermented in 3-4 hours. Occasionally we had to let a batch of leaven go really sour, or, add some rye sour into the leaven as we worked the leaven so hard that the acid content had fallen way down; a rare problem indeed for the home baker, I suggest? Shiao-Ping, thank you for your most recent reply making reference to LeFleur, Kamir and Leader. How ironic indeed that our French leaven as discussed above needing an injection of acid bacteria, whereas LeFleur and Rubaud both reject the premise. I happen to think it really depends on how you look after/mistreat the leaven in its non-production phase. Commercially, this phase is very short, but for the home baker that will not be the case, unless a constant refreshment regime is applied, and a considerable amount of regenerated leaven will then have to be thrown out as waste. Don't you think the magic of maintaining a living culture to raise all your bread over a long time period is some really special concept? Unless I was thinking my levain had genuinely gone bad, I'm with Hamelman all the way; but if the base is "off", it has to be thrown out, and a new leaven created in its place. 1 bin of Rye sour comprised 18kg of flour and 33kg water, and just 2kg of original sour; on flour basis this means 670g of fermented flour being used to ferment 18kg of flour [i.e. 3.72%]!!!! After 2 hours the fermenting rye mass would be bubbling up at the top of the bin. When we used the sour after 18 hours it would have dropped right back and the colour changed from the grey of dark rye to a pinkish brown tone with an obvious creamy texture, and the residue of a thin yeast crust on the top. For the home baker life has to be a bit more complicated in that most bakers will use a mother which is retarded in the fridge between baking sessions. That said, when it comes to refreshment for baking, I build enough leaven to have some left over which will then go back in the fridge ready to make the next leaven. I do not keep a pot of degenerating rank sour in the fridge, as that just becomes an acid bath in which no wild yeasts can survive. If you do this it will take an aeon and a fantastically complicated feeding regime to bring the leaven back to a suitable state to make good bread. To this end, I agree wholeheartedly with Shiao-Ping on leaven storage. The mention of German bakers using sour for flavour purposes only, maybe needs the additional reminder that commercial yeast will then be added to the final dough to counter the inability of the wild yeasts to prosper in the high acidic environment. Only keep a small amount of stock, and make sure to keep it relatively fresh. Yes, it is possible to bring very old leaven back to life and make bread relatively quickly; but I would argue that bread would be poor in quality. A small amount of relatively decent leaven can be fed carefully to produce a fully balanced culture which will yield the BEST bread; this is what we strive for. Please read what Jeffrey Hamelman says in his section on "Detmolder" [pp200] of "Bread: A Baker's Book of..." It gives real context to the need to create the necessary balance of acids and wild yeast. Other than that most other references are academe. They are of great interest and make very challenging reading, but with reward. I think Shiao-Ping would agree with me that the work of Debra Wink on this site is by far and away the best starting point for digging deeply into this complex area. I'm still trying to make sense of a comment made by Hansjoakim concerning high acid concentration and low pH. For Hans, wild yeasts don't like high acid concentrations but don't mind low pH. To me, the wild yeasts are just as sensitive to acid concentration as lactobacillus, if not, even more so! Shiao-Ping is under the impression that a low pH indicates high acid concentration; that these are one and the same thing. I would totally concur with this. Saacharomyces Cerevisiae [Baker's Yeast] does not like acid conditions at all, so plays a very limited role in this type of baking. There are a number of other yeast strains which can tolerate more acidic conditions, but I would suggest that is still over 5 on the pH scale. Working with pH is incredibly interesting; we did some experimentation whilst I was at College, but it would require tremendous dedication to the cause to do it in a home baking context. On that note Shiao-Ping is bang on the money in her discussion of "balance". Yes, a feeding regime can be just a guideline; but it will only work in this way when the baker understands what is needed from the leaven and how to create the conditions that will deliver that. The reference to rhythm is all important. A long-time baking colleague and friend of mine once wrote a small passage explaining how we used to hand knead all our dough in the small bakery he and I set up and ran over 20 years ago. He came up with the monumental phrase "be the dough". In that sense the dough really is what you put into it, in terms of energy, and on many different levels!! Hansjoakim makes reference to high ash content/extraction rate in flour. This definitely impacts on fermentation. I have more direct experience of this with regard to the more conventional bulk fermentation systems. Wholemeal and brown doughs will not tolerate long fermentation in the same way that white flour doughs would. I think this is the real basis to the French ash content system. In the UK we don't really have anything industrially to compare with the Type 65, and 80. I suspect the American way to deal with this is the same as we do in the UK. That is to add in a portion of wholegrain flour to conventional white bread making flour. This may be either strong wholemeal flour, or a dark, or, medium rye flour, or a combination of both. I notice a lot of folks on here use "AP" flour. We have "Plain Flour" as the nearest equivalent, but I would not look to use that myself; it is designed for home bakers making pastry and cake. My favoured alternative to the wonderful all-Canadian strong white flour I have sourced is from the following places. There are some wonderful local farmers/millers who produce an equivalent of this ash content, and it is great to make bread from these organic and sustainably produced strains. For all that, our climate in the UK is rubbish, as many of you will no doubt know. A local miller who has supported me by coming in to lecture to my students grows single strain rare breed organic wheat on his own farm, milled at his own brand new, but traditional, stone grinding mill just 3 miles away from the farm. His flour has quite a high protein content, and it can be used to make great bread, through long fermentation. For all that the gluten quality is, to me, very low in comparison to the strong flours derived from Canadian and North American climates. That has to be expected and accepted when taking the decision to use these flours. The English climate is what it is, and these wheats have been grown in a non-intensive and environmentally sensitive way. I'm still trying to make sense of a comment made by Hansjoakim concerning high acid concentration and low pH. For Hans, wild yeasts don't like high acid concentrations but don't mind low pH. To me, the wild yeasts are just as sensitive to acid concentration as lactobacillus, if not, even more so! Shiao-Ping is under the impression that a low pH indicates high acid concentration; that these are one and the same thing. I would totally concur with this. I tried to convey what I've gathered so far in terms of acid concentrations, pH values and yeast and lactobacilli response to them in this comment. Let me first state that I completely agree with you regarding the fact that wild yeasts don't like high acid concentrations. Wild yeasts are particularly sensitive to acetic acids, and yeasts are inactivated when the acetic acid levels are high enough. The lactobacilli, on the other hand, are not directly affected by the acid concentration. The lactobacilli are sensitive to the pH level, and will keep producing lactic and acetic acid as long as the pH is above 3.6. The relationship between acid concentration and pH is determined (among other factors) by the flour's buffer capacity. If the flour has a high buffer capacity (e.g. whole-meal flours), higher acid concentrations is required to reach a certain pH than if a low buffer capacity flour is used. As an example, using Rubaud's levain, which contains mainly white flour (i.e. a flour with low buffer capacity), even modest acid concentrations will significantly lower the pH. So we've got a starter with a low pH (which inhibits further lactobacilli growth) and a relatively low concentration of acetic acids. Thus, growth of yeast is favoured over growth of lactobacilli. Thanks for commenting and adding helpful information. Is there any way you can clarify the difference between acid concentration and pH? I thought these would be one and the same thing. Also, are you able to provide a relatively simple explanation of what is meant by buffering capacity, and its effects on the gathering of LAB and wild yeast? I'm not that great at science, although, obviously I have experience of dealing with the situations you talk about in the practical world. Thanks for your reply! It's been years since I studied any serious chemistry myself, so take my words with some (plenty) grains of salt! So if your flour has high buffering capacity, the lactobacilli can produce more acetic and lactic acids before the pH starts to drop than if your flour has low buffering capacity. Thank you for getting back to me. I'm getting there very slowly. It's 29 years since I did my Chemistry "O"Level; the only thing I've done since then was an assignment on Baking Powders for my Bakery Quals; so complex chemistry quickly goes over my head. However, mention of phytic acid sets all sort of buzzers going in my head. Have you read Andrew Whitley's "Breadmatters"? Also, I dug out this academic paper:http://ukpmc.ac.uk/articlerender.cgi?artid=322992 It has a great set of additional references to close the paper. Anyway, very quickly, the lactobacilli lowers the phytic acid in the bran to make all sorts of vitamins and minerals available which the phytic acid would otherwise prevent human digestibility. I think there is also a correlation with peptides and the breaking down of the gliadin fraction which is proving so lethal for coeliacs and those with a gluten intolerance. I don't know if this is connected to phytic acid, however. Now I come to think of it, when we did the pH testing in college, the whole system revolved around the creation of buffering solutions. The dough was then slurried into that to dermine the pH reading. Does that sound correct to you? I will have to keep thinking about this, as it is very unfamiliar territory for me. However, now I'm on the right path, and can use your explanation above as reference for the role of the buffer and its impact on pH levels, as opposed to acid concentration. Hi Hans, please excuse my butting in :-) I just wanted to say that your previous posts were spot-on about the yeast being sensitive to acetic acid concentration, rather than pH or lactic acid, and that the two things are different. Yeast is relatively insensitive to pH and other acids in the normal range encountered in bread and sourdough. Lactic acid bacteria, however, are very sensitive to pH. The buffering capacity of the dough comes from the minerals in the flour, or 'ash content.' Phytic acid binds minerals, so I can see how it may play a part. I don't know exactly how minerals provide buffering, maybe a chemist can explain that, but they do in hard water as well (I remember from my tropical fish-keeping days, having to soften the water before its pH would budge). On the rest, you are mostly right, except that a buffer does not neutralize the acid. Neutralization is a chemical reaction between an acid and a base, that turns them into something else, thereby removing them. The simplest example I can think of is HCl (hydrochloric acid) + NaOH (sodium hydroxide) react to form NaCl (sodium chloride) + H2O (water). A buffering agent then isn't an acid and a base, which would react and cancel each other out, but rather it is an acid plus an acid salt (and a real chemist will have to take it from there). But you are right, in that the H+ is absorbed (albeit without being neutralized) in a way that it doesn't have the same impact on the pH. Not sure if I helped this discussion at all---maybe SteveB could weigh in. I've been following along on this and the other thread from Shiao-Ping with great interest. I too have been experimenting with the process that MC expressed in her blog on Gerard Rubaud's batard. The apparent conflicts to my own experiences have got me re-thinking what I know for sure, if you know what I mean. As an aside, would you share the details on that wonderful white bread you posted an image of? I'm not quite sure what I'm looking at there but the crumb color is remarkable and translucent. Back to the GR thread. Your discussion with hansjoakim about acid levels and pH has me confused. As has been stated several times these are the same are they not? The pH is the measurable number relating to the total acid content, yes? I understand there are different acids and that they produce different flavors but as measured by a pH meter, a lower pH would mean higher acid concentration would it not? I'm glad you are writing here Andy, I'm enjoying your perspective very much. pH is an indication of acid strength, not acid amount or concentration. pH varies depending on the particular acid(s) involved and the buffering capacity of the medium. Acetic acid is stronger than lactic acid. If the pH in a starter is decreasing, it means either that acetic acid production is greater than lactic acid production or that the acid amount is increasing enough to overcome the buffer. Thank you for joining in this thread. I have seen some of your previous posts, and the lovely bread you make. As you can see, there have been some invaluable and considered responses regarding the technicalities of pH and acid concentration. It is helping me to learn a lot; thank you very much to all of you. As for the bread you wanted more info for; here goes. I have to admit that I calculate all my dough formulae at home "on the back of an envelope". It is entirely dependent on how much a] flour, or, b] leaven I have available. My methods are pretty consistent, so I think you can say that my re-construction below is pretty accurate. Thank you very much for your kind words about the bread. Build 1: Day One 06:00, DDT 28°C, ferment conditions ambient. 08:30 Mix dough by hand for 20 minutes, using a little olive oil on the hands for lubrication. Final DDT 24°C. Bulk ferment for 2 hours. Stretch and fold. BF further 1 hour. Scale, divide and mould. Proof in bannetons. These were stored under plastic sheeting in front of our wood burning stove, although, it must be said, the hearth is considerably lower than the stove, so please do not assume the dough pieces were subject to the full blast of the fire, as this is not the case. I made 4 large loaves from this; 1 @1100g, 2@ 950g plus one at just over 750g. 1. I have 3 bricks on the lower shelf of my fan electric oven, with a thin metal baking sheet sitting on top of the bricks, and an old roasting pot on the floor of the oven filled with large pebbles. 3. Pour boiling water onto the pebbles for steam, and tip out the loaf onto the hot tray. I give a light flour dust only to this sheet. 4. Score the loaf, and set on the sheet on top of the hot bricks. 5. Turn the oven down to 200°C after 15 minutes, and turn the sheet round through 180°. 6. After another 10 minutes drop the loaf directly onto the brick, and use the baking sheet to cover the roasting pot to prevent any more moisture getting into the oven chamber. 7. Bake out a further 10 - 15 minutes, remove from oven and cool on wires. 8. Re-heat the oven for 10 minutes before baking the next loaf. 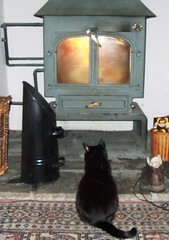 Here's a picture of our cat worshipping the fire for amusement value, and to illustrate the proving environment. It is unlikely I would have the fire blasting like that for the whole proof period, but we were in the middle of some of the coldest weather we have had in the UK for a good few years. I completely agree Andy. This and the other thread from SP are some of the most interesting reading I have seen on the subject of yeast/acid/pH/activity. I have learned much from the discussion. The stream of wisdom flowing in the threads was fun to follow along. Thank you for sharing the method and formula for your Pain au Levain with two starters. Your form reminds me of the school of Hamelmen. The way you put your formula together is familiar and easy to follow. I'll give it a go. I live in Wisconsin in the South East near Lake Michigan. We are a state away from Minnesota which is a grain growing area. As far as I know there are not any old farming operations near here where I could go to find good stone ground flour. Good cheese, yes. Flour, I don't think so. I am fortunate in that I am able to source really great fresh ground WW, Rye, Spelt and Durum from a member here (flourgirl51) for a very good price, from Minnesota. I envy your option of being able to support a local mill. There is something wholesome feeling about having confidence in your food source. I get pride from knowing I'm doing the best I can, if you know what I mean. "Be the dough" so to speak. Thanks again Andy for your clairity and wisdom here. I know it is appreciated by many. I look forward to seeing what other tricks you have up your sleeve. You know when things just look perfect and you know they are going to be great. That's what is happening with your "Wonderful White" mix. It has been in the cooler for a few hours now and I can tell now this is going to be terrific. I think the hydration shift of the two levain builds is what has me so excited. Great activity so far and it smells out of this world. Thanks. I'll let you know how it finishes tomorrow. (let's see it's 8:30 AM in the UK) later today. Perhaps I can explain the over-riding logic behind this process Eric? My stock leaven can remain untouched in the fridge for anything up to a month, but usually 2-3 weeks. So to get it going as quickly as possible I work on the following principles: Mix to a batter, as the higher water availability will please the dormant yeast. Use hottish water, and flour to achieve a refreshment of upto 30*C. My kitchen will be about 22*C, so the new levain build will settle to a good temperature quickly. I only use a small amount of fresh flour in the first build, relative to the fresh flour proportion in the 2nd build; again, this is not to overburden the tired old leaven and make it work too hard to feed off all this flour. It works, but it is not like the Detmolder system outlined by Hamelman. Let me know how you get on; you seem very confident and I'm really pleased to read that. The proof time 17:00 ? I wonder if you could clarify about your total dough fermentation time. In another comment, you mentioned 2 hours bulk and 3 hour proof. But over here you said dough temperature 24*C and 2 hours bulk followed by stretch and fold then anohter hour of bulk. Then, divide, shape and prove (at around 30*C). And then you mentioned proof time for the first loaf was 17:00? Your levain formula poses something really interesting for me to learn. Thank you very much. Home bakers on TFL are very lucky indeed. Yes, I don't have exact detail, as I don't tend to record what I do at home. I am meticulous whilst at work in recording the detail as I want to make this information available to my students. I am similarly meticulous at home, as I want to make the best bread possible for my wife and I to enjoy! However, at home it becomes informal and enjoyable in a different way. So, I really do write my formula on the back of an envelope. So long as I have balanced the formula to what I want to make, I am happy to go from there. Beyond that, I don't write anything down!! So, some of what I wrote for Eric will not be 100% accurate. I have re-read the comments in the blog , and realise I recorded the time final proof ended, rather than the length of time final proof took. If you look at the timings it seems to equate to 5 hours final proof. That is probably about right. Generally it takes most of the day to make these breads. That, ultimately is why I go for long, overnight proof of the leaven portion. On reflection, maybe the final dough was somewhat cooler than 24*C? But I did not record a probe reading...somewhat remiss really! I think Eric picked up on the key principle of confidence in the levain build and the subsequent activity and balance. Most people here seem to have devised great baking systems that work for their own situations. If you reflect on the discussion we had where we agreed that the best bread is made when everything is truly balanced; a whole of numerous complex factors? The leaven is the very start of it: so if your leaven is "kicking" just how you want it to be, that's the best start. Beyond that, is your formula balanced? Correct hydration; acceptance that the pre-ferment uses just the right proportion of flour for the product you are trying to make; is the salt % to your taste, and sufficient to give high quality dough, and control of fermentation; what about any soakers, or, any enriching ingredients??? etc, etc. Do you think a blog on laminated yeasted doughs would go down well here at TFL? Many thanks for your write up. Yes, there will certainly be interest in laminated yeasted doughs. For most home bakers that is definitely one area that presents challenges. I have not once done a successful croissant because of lack of control (or proper management) of dough temperature. (It almost seems impossible to make a croissant dough in a room temperature which is 30 degree C and above. There is got to be a way but I just haven't had the patience to experiment. Sure I fridge the dough but the task just seems daunting.) Most people would agree with me that the commercial bakeries seem to do laminated doughs so easily, everything seems to flow so smoothly for them, not the least because their room temperature is constant, etc. So, I will be very interested to see how a home set up with variable temperatures and just the usual utencils can adapt to the process of laminated doughs with ease. Thank you very much for that! If their Mummy can make croissant, my daughter and my son would sooner brag to their friends! so, contrary to what is generally done with wheat sourdough, you used the rye sourdogh not when it was at its peak, but when it was already past the peak by a large amount of time. I guess you do it to exploit its acidity, if I'm not misunderstanding. Bit of personal preference going on to some extent here, but not entirely. I think, fundamentally the rye has to be sour. This is because of the way the gluten forms in rye. Mini made some excellent remarks about how delicate the paste becomes in latter proof stage. This is because rye paste bonds together through the pentosans, which are fibrous elements around the starch molecules, if I'm not mistaken. They are very unstable, by the time we get to the oven stage, and this is why I never bulk prove all-rye dough, instead opting for the much simpler longer final fermentation. The higher levels of acid exerts a great deal of influence on pentosan stability and the paste breaking down. Additionally, rye needs a lot of hydration as we both well know. So a higher acid content is an effective preservative, preventing rapid mould-growth in a finished bread with such a high moisture content. Personally I don't like rye as sour as some people, but appreciate the need for a genuinely sour element for performance; that is why I add molasses for example, to give a mild sweetness to balance the sour. In a wheat leaven, I am not looking for sourness at all. Personal taste, but I want just sufficient acidity to give a balance which allows the leaven to perform optimally. With wheat, I find that optimum is only lightly acidic. I have been reading for days, yet stumble upon the simplest thing I don't know. What constitutes "strong white flour"? I've never seen it to sell, labeled as such. Apologies for your time taken/wasted on a novice's inexperience but thank anyone advising my direction. It's white wheat flour suitable for general breadmaking.